National Theatre Live: Macbeth(11 a.m. Saturday only) Shakespeare’s most intense and terrifying tragedy explores the damaging physical and psychological effects of political ambition on those who seek power for its own sake. Set in the ruined aftermath of a bloody civil war, in a ravaged world where everyone is ruthlessly fighting to survive. Here we meet the Macbeths, a couple propelled toward the crown by forces of elemental darkness. Rated PG-13. Beautiful BoyBased on the best-selling pair of memoirs from father and son David and Nic Sheff, “Beautiful Boy” chronicles the heartbreaking and inspiring experience of survival, relapse and recovery in a family coping with addiction over many years. 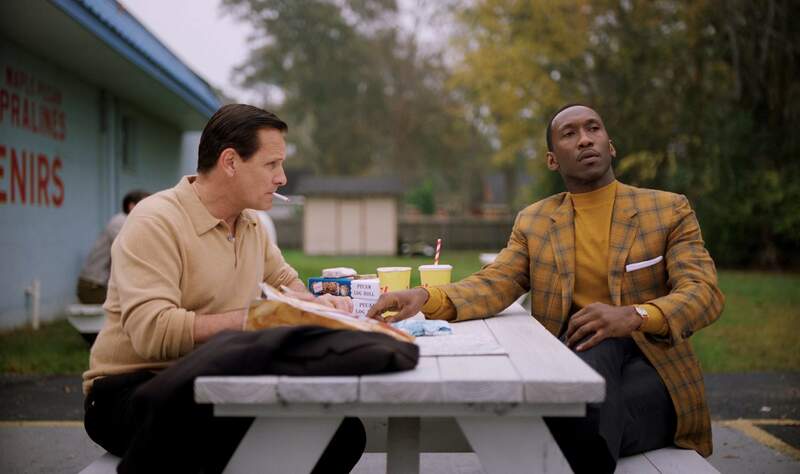 Green BookWhen Tony Lip (Viggo Mortensen), a bouncer from an Italian-American neighborhood in the Bronx, is hired to drive Dr. Don Shirley ( Mahershala Ali), a world-class African-American pianist, on a concert tour from Manhattan to the Deep South, they must rely on “The Green Book” to guide them to the few establishments that were then safe for African-Americans. Confronted with racism and danger – as well as unexpected humanity and humor – they are forced to set aside differences to survive and thrive on the journey of a lifetime. Rated PG-13. The Front RunnerFollow the rise and fall of Sen. Gary Hart, who captured the imagination of young voters and was considered the overwhelming front runner for the 1988 Democratic presidential nomination when his campaign was sidelined by the story of an extramarital relationship with Donna Rice. As tabloid journalism and political journalism merged for the first time, Hart was forced to drop out of the race – events that left a profound and lasting impact on American politics and the world stage. Rated R.
The Possession of Hannah GraceA shocking exorcism spirals out of control, killing a young woman. Months later, Megan Reed (Shay Mitchell) is working the graveyard shift in the morgue when she takes delivery of a disfigured cadaver. Locked alone inside the basement corridors, Megan begins to experience horrifying visions and starts to suspect that the body may be possessed by a ruthless demonic force. Rated R.
Creed IILife has become a balancing act for Adonis Creed. Between personal obligations and training for his next big fight, he is up against the challenge of his life. Facing an opponent with ties to his family’s past only intensifies his impending battle in the ring. Rocky Balboa is there by his side through it all and, together, Rocky and Adonis will confront their shared legacy, question what’s worth fighting for and discover that nothing is more important than family. Creed II is about going back to basics to rediscover what made you a champion in the first place, and remembering that, no matter where you go, you can’t escape your history. Rated PG-13. Ralph Breaks the InternetVideo-game bad guy Ralph (voice of John C. Reilly) and best friend Vanellope von Schweetz (voice of Sarah Silverman) leave the comforts of Litwak’s arcade in an attempt to save her game, Sugar Rush. Their quest takes them to the vast, uncharted world of the internet, where they rely on the citizens of the internet – the Netizens – to help navigate their way. Lending a virtual hand are Yesss (voice of Taraji P. Henson), the head algorithm and the heart and soul of the trend-making site “BuzzzTube,” and Shank (voice of Gal Gadot), a tough-as-nails driver from a gritty online auto-racing game called Slaughter Race, a place Vanellope wholeheartedly embraces – so much so that Ralph worries he may lose the only friend he’s ever had. Rated PG. Robin HoodRobin of Loxley (Taron Egerton), a war-hardened Crusader, and his Moorish commander (Jamie Foxx) mount an audacious revolt against the corrupt English crown in an action-adventure packed with gritty battlefield exploits, mind-blowing fight choreography and a timeless romance. Rated PG-13. Fantastic Beasts: The Crimes of GrindelwaldAt the end of the first film, the powerful Dark wizard Gellert Grindelwald was captured by Magical Congress of the United States of America, with the help of Newt Scamander. But, making good on his threat, Grindelwald escaped custody and has set about gathering followers, most unsuspecting of his true agenda: to raise pure-blood wizards up to rule over all non-magical beings. In an effort to thwart Grindelwald’s plans, Albus Dumbledore enlists his former student Scamander, who agrees to help, unaware of the dangers that lie ahead. Lines are drawn as love and loyalty are tested, even among the truest friends and family, in an increasingly divided wizarding world. Rated PG-13. Instant FamilyWhen Pete (Mark Wahlberg) and Ellie (Rose Byrne) decide to start a family, they stumble into the world of foster-care adoption. They hope to take in one small child, but when they meet three siblings, including a rebellious 15-year-old girl (Isabela Moner), they find themselves speeding from zero to three kids overnight. Now, Pete and Ellie must hilariously try to learn the ropes of instant parenthood in the hopes of becoming a family. Rated PG-13. The GrinchEach year at Christmas they disrupt his tranquil solitude with their increasingly bigger, brighter and louder celebrations. When the Whos declare they are going to make Christmas three times bigger this year, the Grinch realizes there is only one way for him to gain some peace and quiet: He must steal Christmas. To do so, he decides he will pose as Santa Claus on Christmas Eve, even going so far as to trap a lackadaisical misfit reindeer to pull his sleigh. Meanwhile, down in Who-ville, Cindy-Lou Who – a young girl overflowing with holiday cheer – plots with her gang of friends to trap Santa Claus as he makes his Christmas Eve rounds so that she can thank him for help for her overworked single mother. As Christmas approaches, however, her good-natured scheme threatens to collide with the Grinch’s more nefarious one. Rated PG.